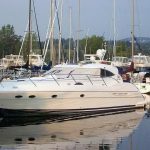 Neptunus builds a high quality semi custom yacht in St. Catherines Ontario. 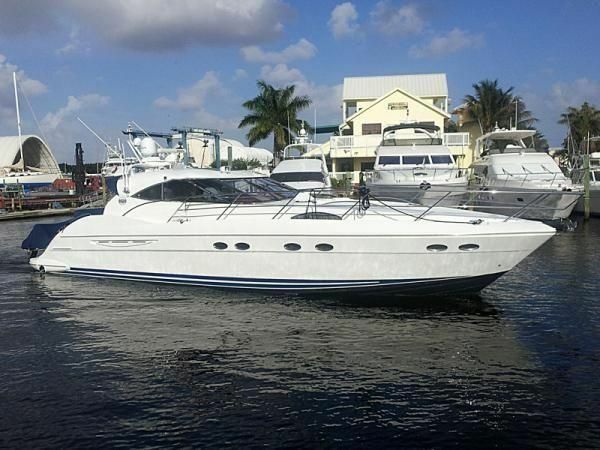 This express cruiser with hardtop owner will consider trades for residential real estate or a smaller power boat and cash. She is loaded including an electric sun roof, hydraulic swim platform, Satphone and SatTV. She was repainted with Imron in 2011, just had a bottom paint job in 10/14, and her engines serviced 2011. BE SURE TO VIEW THE VIDEO! Call now to arrange a showing. Tender is not included. During the construction phase additional layers of glass reinforcements were added to the laminates well as additional longitudinal in the structure. 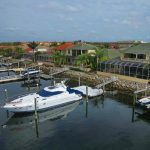 Since the yacht was original to be stored on a lift out of water when not in use these additional reinforcements enhanced the structural integrity of the vessel both while on the lift and when at sea in that the structural rigidity of the vessel was increased. This attention to the rigidness of the vessel coupled with the larger Series 60 MTU 825 Hp engines combine to produce faster cruising speeds at 28 knots and top speeds in excess of 32 knots, more than other Neptunus 56 Expresses. 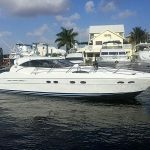 This yacht is a great family boat for entertaining as there is a secure feeling of openness in the enclosed upper salon/Helm area where views abound in an atmosphere where everybody is able to be together in comfortable dry surroundings. Forward is the Helm area with a Stidd captain’s chair and bench for 2-3 others. 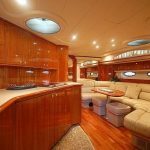 Entry to the aft deck from the Upper salon is through the dual opening glass door which creates an open entertaining area where there is a large comfortable seating area complete with cockpit table, BBQ, icemaker and sink. The cockpit sole is teak enhancing the atmosphere of the cockpit. The hydraulic swim platform is gated for safety and is accessed via a starboard staircase. 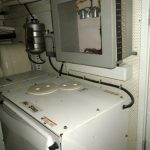 There is also access to storage in the lazarette where there is a separate washer and dryer and access to the engine room from the cockpit. Back inside the vessel and down a few steps you enter the galley and lower salon areas. The galley is large and easy to navigate with refrigerator/freezer and a built in dishwasher. The lower salon settee is also large and comfortable and has a 36″ LCD TV. 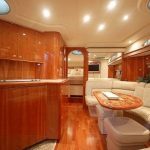 The flooring in the galley is granite while the balance of the lower salon sports the warm patina of natural cherry flooring throughout making the salon a snap to keep clean. 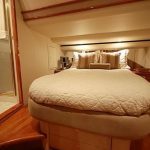 Aft is the master Stateroom with separate en suite head and shower while the VIP forward with its separate head and shower completes the Accommodation Plan. The fore deck is fitted out with a large spacious sun pad. Upper Salon/Helm There is a built in LCD TV aft and to port with a stereo surround sound system and reception for satellite TV. 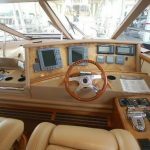 The Helm features comfortable captain’s chair and addition seating so everyone may be together while running the boat. All controls are conveniently located to the Helm as are the navigation/communications instruments. An additional air handler under t he Helm provides additional cooling for this area. Side windows lower electrically to allow fresh air into the cabin and for communication during docking procedures. There also is an electrically opening overhead sun roof for additional air and sun when desired. When it is not desired and the sunroof is closed there is a manual sliding cover to prevent radiant heating from the sun within the enclosed opening. Galley/Lower Salon The Galley is below and to Port. Included are custom counter tops, dual side by side Sub Zero refrigerator and freezer. Flush mounted 3 burner Princess electric stove, built-in microwave, built-in space saver coffee maker. Large stainless steel sinks and ample storage. 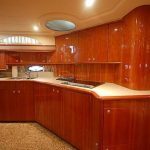 Across from the galley area is a large C-shaped leather sattee with table and custom mount 36” Flat Screen LCD TV for viewing from the settee and galley area. 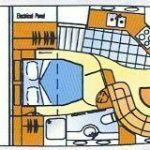 Master Stateroom The accommodation plan features two cabin layout with larger master stateroom in the mid ship area of the boat with ample drawer storage and hanging locker. A private adjoining head/shower compliments the master. 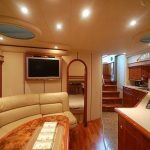 Queen size berth with inner spring mattress Storage under berth and various cupboards. Cedar lined hanging locker, port and starboard. 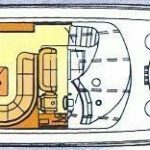 Two 110V outlets 2 reading lights Indirect lighting 4 halogen lights VIP Stateroom The VIP stateroom is located forward and is a full second master. It is complete with ample drawer storage and hanging locker similar to the master. There is access to the bed from either side an adjoining head/shower completes the comfortable space of the VIP. Large berth with inner spring mattress Storage space under bed, 2 drawers Various cupboards above portholes Cedar hanging locker Starboard Cedar lined hanging locker Port side mirror behind bed 4 fixed ports Two 110 Volt outlets Two reading lights 4 Halogen lights Escape hatch with screen Structure Hull deck and all structures are constructed from fiberglass laminates. Longitudinal and athwart ship stringers reinforce the whole hull. The vessel’s structure and laminates were increased during the construction phase in order to further re-enforce the hull as the boat initially spent most of its time on a lift and the owner wanted to ensure there was no movement at all in the boat while in storage. 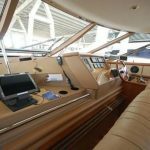 All partitions and re-enforcements are constructed of plywood or foam and are laminated to the hull on both sides. The engine stringers run from bow to stern and incorporate the engine mounts where steel top plates are embedded for the engine mounts. The deep Vee hull coupled with a 19.5 degree dead rise aft has been designed to ensure a vessel with excellent seafaring qualities and a dry ride. Special attention has been given to the ratios between installed power, speed, and fuel efficiency. 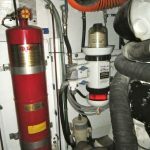 Propulsion Detroit Diesel/MTU series 60 inline 6 cylinder 825 Hp each turbocharged and intercooled main engines with V drives. Detroit Diesel MTU EDMs (engine data modules). 220 volt engine preheaters. 32″ x 41″ props with spares. Oil-X-Changer oil change system built in. LassDrop shaft seals. Steering & Controls Sea Star hydraulic steering with tilt helm. Detroit Diesel MTU electronic single lever controls with backup panel. Vetus 352 Lb. force 24 volt bow thruster. Bennett trim tabs. Fuel System 2 x 340 USG aluminum fuel tanks forward in engineroom. 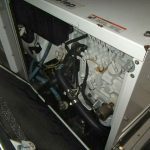 Detroit Diesel SeaPro 152 fuel/water separators for main engines. Racor 500 generator fuel/water separator. Fuel tank level sighting tubes in engineroom. Analog fuel level gauges on control deck dash. Fuel priming systems. 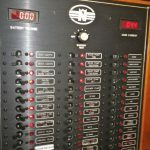 Electrical 240/120 volt 60 Hz system with split 120 volt buss. 240 volt 50 amp shorepower cable with Glendinning cablemaster. Shorepower is input at 240 volts into a Rex 240/120 volt shorepower isolation transformer. Charles Smart Boost 50 isoboost transformer. Onan 13.5 Kw MDKAZ generator in sound sheild with remote start panel in main electric panel. Main electric panel with split AC and DC sections, AC shorepower reverse polarity indicator lights. 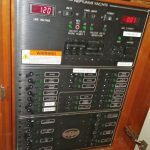 Digital AC volt meters with line1/line 2 switching. Digital AC ammeters with line1/line 2 switching. Digital DC voltmeter with battery bank selector switch. Digital DC house load ammeter. Magna Sine Magnum inverter with digital controller/monitor. 4 x West Marine 1150 CCA 12 volt gel cell batteries. 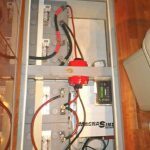 Inverter/shorepower selector. 12 and 24 volt battery chargers. Fresh Water System. Aluminum 130 USG tank. Headhunter 120 volt fresh water pressure pump. 220 volt water heater. Rain Fresh galley water filter system. Vinyl water lines. Analog fresh water tank level gauge at main electric panel. 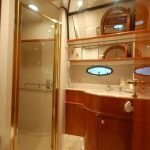 Aft deck hand shower on swim platform stairs side. Sanitary Systems Raritan DC toilets. 85 USG aluminum holding tank. DC sewage discharge macerator pump. Analog sewage tank level indicator at main electric panel. DC shower sump pumps. 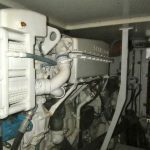 Ventilation & Air Conditioning Marine Air Systems raw water cooled reverse cycle air conditioning. 2 x 24000 BTU compressors. Digital air conditioning controls. 120 volt engineroom blowers. 12 volt head blowers. Galley exhaust fan. 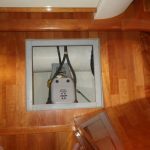 Bilge Pumping System 4 DC Rule 3500 GPH automatic submersible bilge pumps in forward bilge, forward engineroom, aft engineroom, and lazaret. Bilge pump “ON” indicator LEDs at dash. Bilge level alarm LEDs at dash. 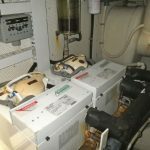 Bilge run counters on forward bilge, aft engineroom, and lazaret bilge pumps. Bilge alarm test switch at dash. Ground Tackle Maxwell reversing vertical capstan with switches on fore deck and at helm. ~ 60# stainless steel Neptunus custom stainless steel plow type anchor. 3/8″ galvanised chain. Appliances Meiele electric Bar B Q on aft deck. Sub Zero under counter refrigerator and freezer with ice maker in galley. 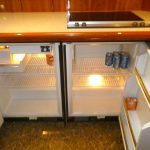 Norcold bar refrigerator/ice maker on aft deck. 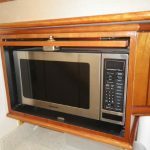 Panasonic Dimension 4 microwave convection oven. AEG 4 burner flush glass top electric range. Whirlpool washer and dryer in lazaret. Electronics Raymarine L1250 fishfinder chart plotter. Raymarine RL80C radar chart plotter. Raymarine ST 60 Depth instrument. Raymarine ST 60+ depth instrument. 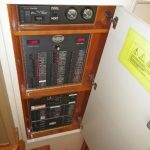 Raymarine ST 60 speed/log instrument. TFT CCD CCTV monitor with camera on aft deck. Raymarine Navigator control pad. Simrad AP20 autopilot. Motion Computing tablet PC with keyboard and mouse interface for use with AIS system. SeaCas Safe Passage AIS 300. Icom Command Mike. Icom IC-M602 DSC VHF radio telephone. 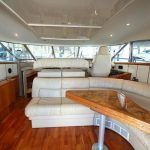 Entertainment Clarion stereo speakers throughout and on aft deck. Sharp Aquos 36″ LCD TV in lower salon. Aquos 28″ flat screen TV in upper salon. Direct TV satellite receiver in upper salon. Sea Tel satellite TV and satellite telephone. Glomex broadcast TV antenna. Clarion AM/FM/ cassette stereo in upper salon with CD changer. Sony DVD player in upper salon. RCA 14″ color TVs with VCRs built in in both staterooms. Clarion car stereos in each stateroom. Canvas All blue Sunbrella: Tender cover. 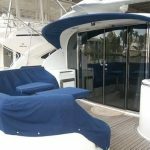 Aft deck settee cover. Aft deck table cover. Aft deck brow sunshade. Vinyl mesh windsheild sun shade cover. 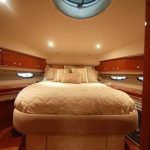 Foredeck sun pad cushions. Safety Carbon Monoxide detectors. Fireboy fixed automatic engineroom FE 241 fire extinguishing system with indicator panel at helm. Portable dry chemical fire extinguishers in interior. 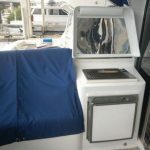 Pilothouse windsheild wipers with washers. Remote controlled Jabsco searchlight. 6 man offshore liferaft. Richie hemispherical magnetic steering compass. Equipment Additions ’07/’08 50 Amp Charles SmartBoost shorepower transformer Magnum Sine Wave 4KW Inverter and 2 Gel batteries (’08) SeaCas (Collision Avoidance) antenna and USB Interface for PV (’08) WeatherWorx antenna and Blue Tooth interfacefor PC (08) A/C Outlet for Chart Table Both Intercoolers on engines replaced (08) Stainless hoses replaced on Swim Platform Hydraulics (08) New Aft Deck Speakers (08) Replaced all LED deck lights (08) Replaced AC unit in Master Stateroom (08) Installed fuel crossover for port and starboard fuel tanks All C Map Charts for Bahamas, Florida, to Great Lakes and St Lawrence River 12’ Boss center console Boat Rigid & 25hp Yamaha New 6 man Offshore liferaft(08) Spare props tuned and balanced 2011 Upgrades Full Imron paint from waterline up New Lassdrop shaft seals New Cutlass bearings Trim tabs extended 3” plus a third hydraulic cylinder was added to each tab New electric motors on side windows 2nd Raymarine ST 60 digital depth finder New sun covers on on wheelhouse windows Replaced loud hailer horn Rebuilt ACR searchlight Replaced windlass motor Replaced wiper arms and blades Installed parallel switch for second set of gel batteries (4 total) installed for the Signwave inverter/charger allowing double capacity for house batteries All new cushions in aft cockpit Installed inspection hatch in fresh water tank Overhauled macerator pump AIS antenna coupled to tablet PC w/Captain software from Key West to Great Lakes Both AC chillers replaced Backup camera installed New DVD and CD player installed Aft cockpit lockers had aeration vents installed Cell phone booster antenna 1000 hour Detroit Diesel service on main engines This listing is courtesy of the BoatWizard MLS and may be centrally listed with another broker. It is offered as a convenience to our clients and is not intended to convey representation of a particular vessel.